Military antifungal foot powder is mostly used by active soldiers who have to use their shoes for long hours when there are on duty. It is an antifungal powder with Miconazole nitrate as the active ingredient. The net weight of the powder is 7 oz which is roughly 198 gms. 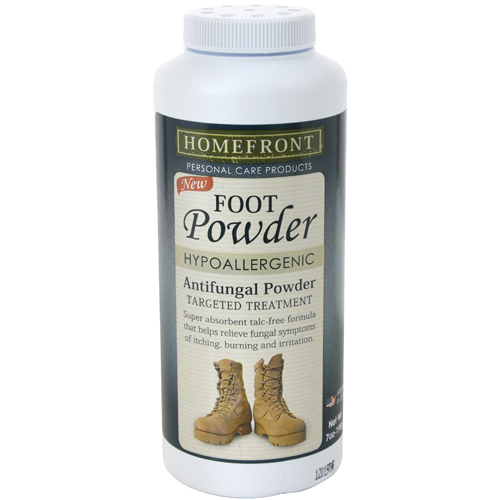 This antifungal powder is formulated with super absorbent formula which helps in relieving most fungal symptoms like irritation, itching and burning sensation. The other ingredients used to make this product include corn starch, lavender oil, sodium bicarbonate, tea tree leaf oil, methyl paraben and tri calcium phosphate. As it contains natural oil from tree extract, it is safe to use. Material Specs: 2% Micanazole carbonate (active ingredient), corn starch, sodium bicarbonate, lavender oil, methyl paraben, tricalcium phosphate, tea tree leaf oil.